Computer fluid dynamics modeling of the Red Bull Stratos capsule in free fall: 156 fps (106 mph), minus 55 F, capsule door open, 2 degrees nose down, 80,000 feet in altitude. Computer fluid dynamics modeling of the Red Bull Stratos capsule: 18 fps (under parachute), 50 degrees F, capsule door open, 2 degrees nose down,15,000 feet altitude. From air freight to space freight – Lufthansa Cargo flew the Red Bull “Stratos” space capsule from Los Angeles to Frankfurt at the weekend. In October 2012, Austrian extreme sport legend Felix Baumgartner jumped out of this very capsule from a height of almost 128,000 feet. In collaboration with the “Schaefer Trans Inc.” transportation company, the flying machine was moved on a flat-bed trailer from the facility of the “Sage Cheshire Aerospace” manufacturer in the Californian desert to Los Angeles International Airport (LAX). The 1.45-tonne capsule was then reloaded onto a Boeing 777F of AeroLogic, a joint venture between Lufthansa Cargo and DHL Express. 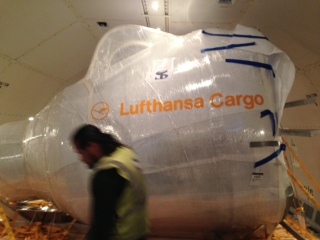 Following the transatlantic flight to Frankfurt, the space capsule was reloaded onto a special flat-bed trailer and transported to Salzburg. The capsule and the spacesuit worn by Felix Baumgartner will be displayed alongside other flying machines and sports cars in Hangar-7, Red Bull’s own aircraft museum in Salzburg Airport, in the future. Austrian Felix Baumgartner ascended into the stratosphere in the space capsule on 14 October 2012 with the aid of a helium balloon. From a height of 24,214 miles, he free- fell towards the earth at speeds of up to 843.6 mph, setting multiple records in the process. Besides achieving the record for the highest altitude jump, Baumgartner was also the first person to break the sound barrier in a free fall. The jump was broadcast live on various media channels and on television worldwide and is considered one of the most successful marketing campaigns of all time.